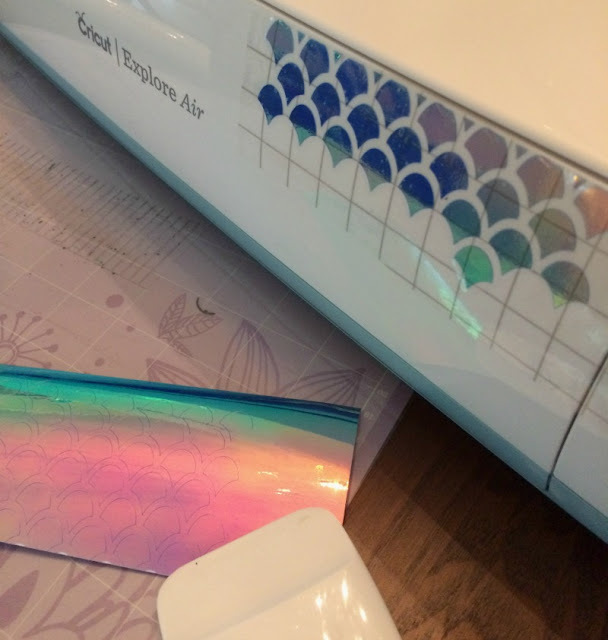 I have had my Cricut for about 9 months now and have shared a ton of projects already, but I wanted to tell you a little more about my Cricut Explore Air since I have had a lot of comments and questions lately. I am also going to show you how to customize it, using the new holographic vinyl! 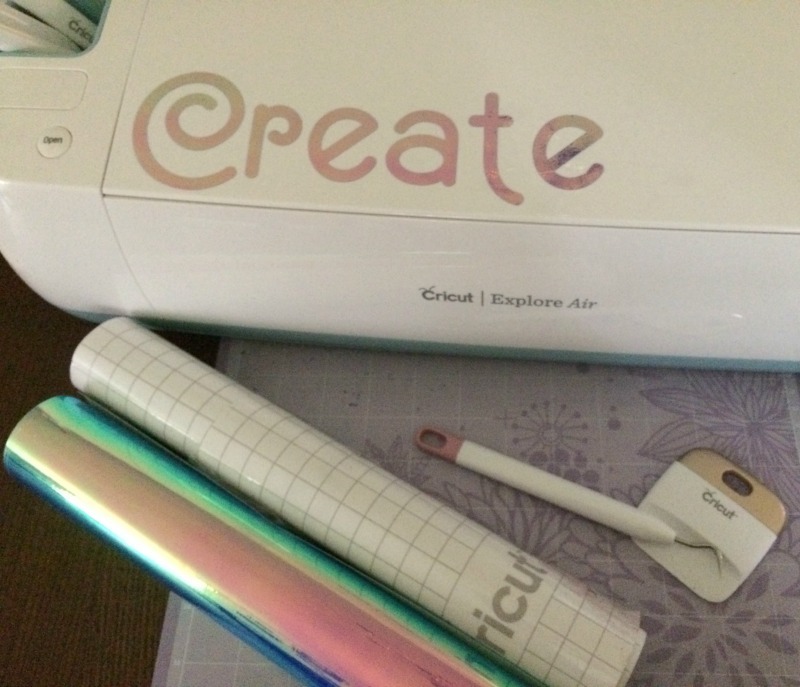 One of my close friends has had a Cricut for years and until I got my own, I thought it was only for making cards and scrap-booking. Boy, was I wrong! This machine can do pretty much EVERYTHING! 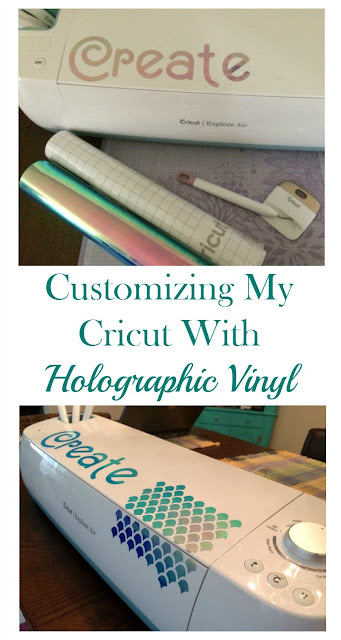 You can read about my initial experience using my Cricut in this post: My First Time Using a Cricut. What comes in a Cricut Explore Air Box? When you open up the box, you have everything you need to get started creating! You just plug it in and get started. It is that easy! This model even works with bluetooth, so you do not have to be connected to your laptop to use the Design Space. Step 1: Open up the Cricut Design Space and use the drop down menu under File to select New Project. Step 2: Add Text and type your word into the text box. I am using the word "Create." To change the Font, click Edit in the menu on the right hand side. 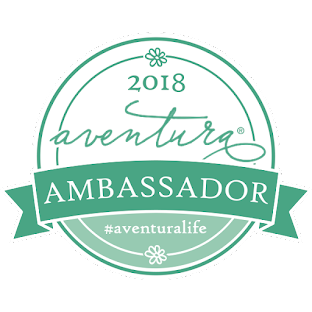 You can choose from a variety of fonts; some are free, others are free with Cricut Access, and some are available for purchase. I chose the Everyday Fonts-Best of Times style because I liked the curled "C."
Step 3: Once you have selected your font, use the handles on the lower right corner of the box to size it to your desired size, based on the measurement of the area you are placing the vinyl. I made mine about 8.5" x 2.5". Step 4: Click the Go button at the top right of the screen. On your Cricut machine, set the dial to vinyl and press the blinking arrow to load the mat into the machine. Your screen should also reflect the material is vinyl. Press the blinking "C" on the machine to start the cut and watch it go! Step 5: Once the cut finishes, press the arrow to release the mat. Carefully weed the excess vinyl from around the letters, using a weeding tool. Step 6: This is where the transfer tape comes in handy. If you do not know what transfer tape is, it is a clear tape with a grid that transfers your word or design from the mat to your piece, while keeping it together. The grid also helps you place it straight onto your piece. For me, this stuff has saved me from messing up many projects! Cut a piece of transfer tape the same size as your vinyl and place it over top. Use a scraper to make sure all the pieces adhere well to the tape and remove it from the mat. Step 7: Place the tape and vinyl onto your piece. In this project, it is my Cricut Explore Air. Again, use the scraper tool to make sure the vinyl has adhered to the piece before removing the transfer tape. The holographic vinyl is gorgeous and photos really do not do it justice. I really want to put this on everything!! These are just a few...the possibilities are endless! 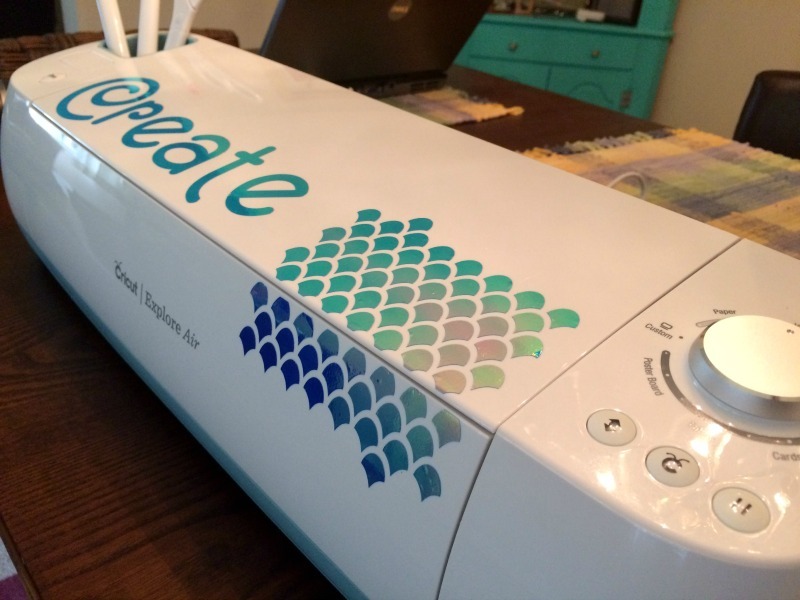 What is your favorite project you have created with your Cricut Explore Air? The mermaid pattern is super cute! Mermaids and unicorns are perfect for holographic vinyl! I agree! 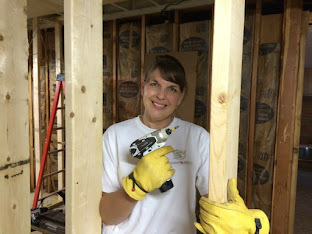 I need to find some more projects to do now! I am in LOVE with this mermaid pattern! It's so trendy right now, too! Me too! I honestly want to put it on everything! 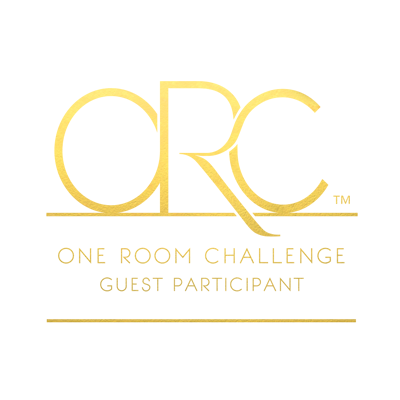 Oh, you have to try it! I am sure it's about as easy as the Cricut machine is to use. You will have so much fun with it! Love the mermaid pattern! 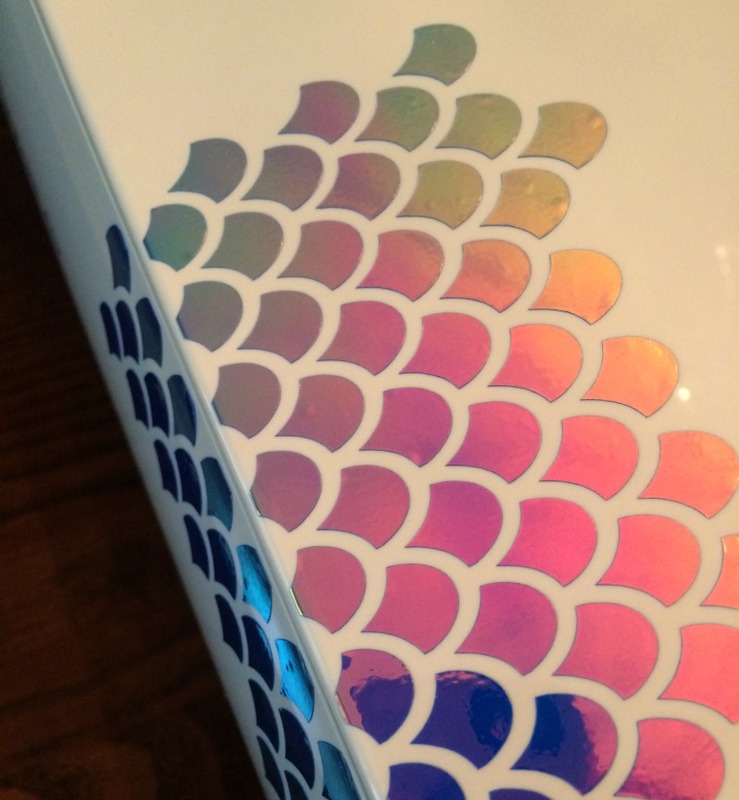 And holographic vinyl!! I didn't know that was a thing! Need!!! I know! I am addicted!